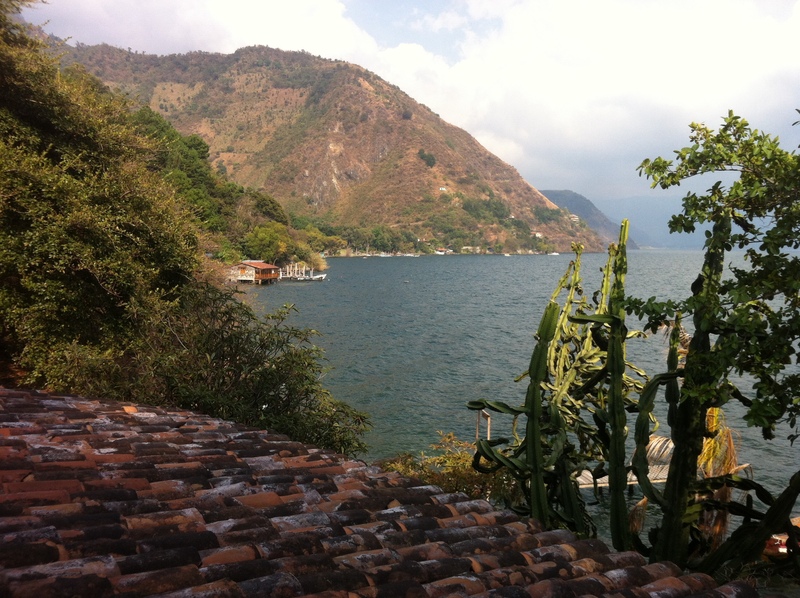 How do people end up in Jaibalito, a tiny roadless village on the shores of Lake Atitlan in Guatemala? That is a question we discussed last night, my first night in this beautiful adobe home on the water. Jaibalito is essentially the only Village left that is accessible only by boat. There are no roads, and no motor vehicles. The only engine sounds you will here are an old corn thresher that fires up every once in a while to perform it’s duties, and the water taxis that pass by every half hour until 5pm, shuttling locals, tourists and school children between the villages. The population here are mostly indigenous Mayan’s, the colourfully clothed and happy people who make a living farming coffee and other produce on the steep hills surrounding the lake. So what are “gringos” doing here? It isn’t for everyone–there aren’t any Sheraton’s or Hilton’s, you can’t flush your tissue down the toilet and the path leading to many of the rentable homes is narrow and rather challenging in places. Some who come here, however, become deeply attached to the people, the lake and the decidedly healthy lifestyle of walking the cobblestoned paths and eating the locally-grown fair. One such German ex-pat is known through the town as Helmut, he runs an open-air restaurant, a hostel, a small grocery; he bakes fresh bread and makes some heart-warming goulash and schnitzel. If you need ANYTHING, Helmut can get it. No-one is quite sure how he continues to thrive after 20 years, whilst barely marking up his retail items, and providing full meals all day for very low prices. Another is Robert, my host, who was struggling with the fierce competition in the IT market in Canada, who realized, while passing through, that he could be much more comfortable and competitive if he lived here – a place he considers paradise. Not only has he discovered that he is more competitive, he has realized that he can serve the community and provide an influx of steady business to the quiet and friendly locals. The draw of the lake and the idyllic setting brought out his desire to serve the community and build a business that has a far greater purpose than his original intention. The lake has lured him but will will he stay? Who knows – but for now, there is a symbiosis between this Canadian businessman and the town of Jaibalito. Most lakes are fished, but I think this one does the fishing. I came to see what this place was all about and I am already beginning to feel the lure of the lake!